Add two numbers in a circle drill. This worksheet contains adding numbers like 23 + 8 = ?. Learn addition of three numbers with this worksheet e.g. 23 + 8 + 12 = ?. Addition of four numbers activity worksheet e.g. 4 + 12 + 5 + 9 = ?. Addition of two numbers up to hundred thousands activity sheet e.g. 120,980 + 456,000 = ? Review addition skills with numbers up to millions. Printable worksheet to supplement your course. Addition of numbers involving regrouping also said with carrying. Borrow and regroup across places. Learn addition of money values, $ 234 + 89 = ?, gain skills on money with this worksheet. Evaluating algebraic expressions, find the unknowns in an equation, develop pre -algebra skills worksheet. Algebra problems combing numbers & unknown letters, find the missing variables. Algebra equations in which you have to solve for the missing variables, gain knowledge in pre-algebra. Pre algebra addition equations with problems in which you have to find the value of 'y', or 'x' or any unknown. Mixed pre algebra equations with problems in which 6th graders need to find unknowns. Learn adding three decimal numbers with this worksheet e.g. 3.4 + 4.67 + 2.03 = ?. 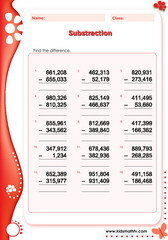 Addition of numbers containing decimals, e.g. solve problems like 23.45 + 4.78 = ?. Algebra equations with decimal values, find the unknown variables in the expressions with this worksheet. Learn how to compare decimals, which decimal number is greater, less or equal to ?. Conversion of fractions to decimals, for example solve problems like 1/4 in decimals = 0.25. 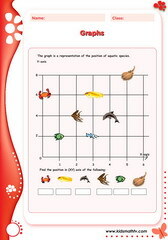 Find patterns with decimal numbers, solve all problems on this worksheet, gain more skills. Illustrated decimal exercise, contains pictures of shaded figures, find decimal equivalences . Learn to multiply decimals, pay attention to place values while doing so. Learn to round up decimals numbers to nearest whole numbers as required in this worksheet. Subtraction of numbers that contain decimal values, place value is very important here. Basic long division of numbers activity worksheet e.g. 25 divided by 5 = ? Divide two by one place numbers worksheet for example 56 divided by 2 = ?. Review division of 3 by 1 digit numbers with this worksheet, for example 234 divided by 2 = ?. 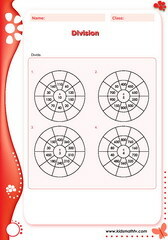 Division of numbers circle drill puzzle worksheet. These are mainly small numbers. Solve problems involving division, match up your answers in the exercise. Division of whole numbers by fractions worksheet, for example 8 divided by 1/2 = ?. Long division of numbers without remainders worksheet. Solve problems like 256 divided by 4 = ? Long division exercises with a remainder worksheet for 6th graders. Let kids improve skills in division. Finding exponent of numbers raised to the 3rd power worksheet for kids to test their skills. Exponents exercises involving raising numbers to the 4th power, converting between standard and expanded forms. Raise numbers in exponents to the 2nd power with this test worksheet. Learn and review addition of fractions, also learn to reduce fractions during the process. Test skills on addition of mixed fractions. On this worksheet find problems like 4 2/3 + 7 4/5 = ?. Converting fractions to decimals worksheet for sixth graders. 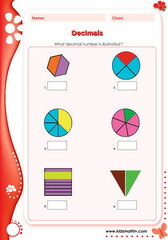 Test your kid's skills on fractions / decimals. Division of fractions worksheet, each problem teaches kids the basic notions needed to solve more similar problems. Division of mixed fractions worksheet. Skills needed involve first converting them to improper fractions. Finding equivalent fractions worksheet. Find which numerator or denominator makes a fraction equivalent. Finding the fraction of numbers worksheet e.g. what is 2/3 of 98 ? 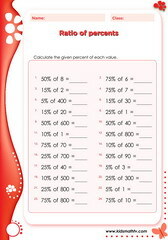 print out a test and get more practice. Multiplication of mixed fractions activity worksheet e.g. 1 2/3 x 6 4/5 = ?. Subtraction of fractions like and unlike denominators, find LCM's, factors etc. Subtraction of mixed fractions worksheet - first convert to improper fractions then subtract both. Find the area of circles test worksheet. the radius is provided and remember pie is 3.14. How to find the area of circles worksheet. The formula is pie x radius squared. Finding the circumference of circles worksheet, there are circles to illustrate the task. Identifying segments of a line worksheet. Identify connecting points and label. Find the perimeter and area of complex shapes worksheet. Add areas of different sections & sum up. 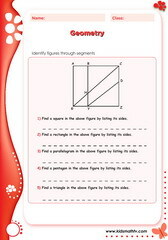 Find the perimeter and area of L-shaped geometrical figures worksheet for 6th grade. Finding the perimeter and area of rectangles worksheet. Use formula length x width = Area. Find missing sides on a polygon, sides or vertices worksheet. Print and practice. Pythagorean theorem worksheet; Using the base and height, find the hypotenuse of traingales. Learn & identify different geometric shapes in mathematics with this worksheet. Relating solid to planar figures math worksheet; circle, square, triangle, pentagon etc. Understanding symmetry of some geometric shapes worksheet. Find and draw lines of symmetry. Practice finding the symmetrical plane of figures with this worksheet.Some have more than one line of symmetry. Finding the symmetry in objects with pictures worksheet. Practice with real life objects. Represent data on bar and linear graphs practice worksheet. Finding points on a graph with the aid of coordinate pairs worksheet. 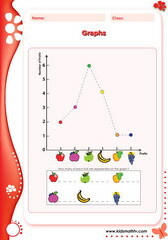 Graph activity worksheet; represent information visually for kids to interpret. Interpreting g data on graphs worksheet. Start learning how to represent on similar graphs. Start representing position of points in coordinate graphs with this worksheet. X,Y coordinate system. Plot linear graphs worksheet. Understand trends of information on plotted linearly. Plotting points on blank graphs worksheet. This will serve as a template for teachers at all graph exercises. Obtain information from data on tables worksheet. Print and practice. Venn diagrams showing sets worksheet. Practice Venn diagram terminology and rules. Statistics represented on Venn diagrams worksheet. Understand relationships with data analysis. The (x,y) coordinate location rules apply on this worksheet. Learn to locate objects in space. Integers subtraction activities with a circle drill puzzle worksheet. Complete the puzzle. Converting between scales mm to cm, ft to yd worksheet. You can do same thing vice versa. Measurement of angles worksheet. Learn practically and later apply to other geometric shapes. Measuring the length of sides of rectangles and calculating the surface area worksheet. Measurement readings on a thermometer worksheet. 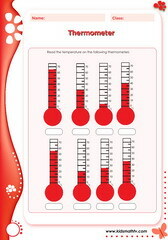 Print and practice how temperatures rise. Mixed operations activity worksheet for 6th graders. PEMDAS with adding, subtracting, dividing etc. 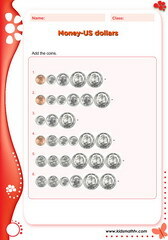 Addition involving coins in US dollar cents, nickle, dime, quarter worksheet. Addition of money amounts worksheet. e.g. add $ 2,456 + $ 678 = ? Learn how to count and add coins in US dollars with this worksheet. Money, buying and making a shopping list math worksheet. Amounts are in USD. Shop and manage money based on a list with unit prices math worksheet. Use / spend money while shopping and calculate total expenditures worksheet. 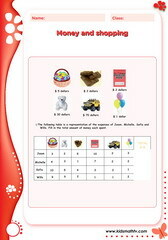 Shopping for toys, clothes, candies etc math worksheet for children. Multiplication quick facts involving multiplying by 1 digit numbers worksheet e.g. 2 x 3 = ? Learn multiplication of numbers by two digit numbers worksheet e.g. 23 x 45 = ? Multiplication of numbers match up puzzle worksheet. Match problems to their answers. Multiplication of fractions worksheet, example 1/2 x 2/3 = ?. Multiply numbers within a table drill worksheet e.g. 2 x 9 = ? Multiplication of numbers involving money values worksheet for extra practice. Find factors of numbers test worksheet e.g. 1/5 of 78 = ? 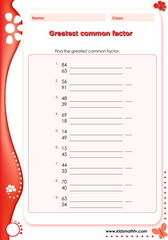 Find the Highest common factor (HCF) of two numbers worksheet. Finding the lowest common multiple (LCM) of two numbers worksheet. Ordering numbers from greatest to least and least to greatest worksheet. Find place value of numbers up to millions worksheet. e.g. what is the value of 5 in 5,678 ? Identifying prime numbers worksheet. Is a number prime or composite ? Converting Roman to Arabic numerals worksheet. Understanding concepts of number theorem. 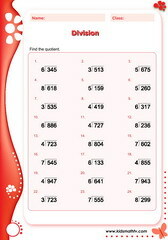 Learn how to spell numbers worksheet. Improve skills on numbers. Spelling numbers worksheet. Start counting and spelling up to hundreds. Finding the square roots of numbers worksheet. e.g. what is the square root of 25 ? Finding patterns in a sequence of numbers worksheet. Complete the patterns. Number progressions and patterns in a number series worksheet. Percentage value of money amounts worksheet. e.g. 6/8 of $ 450 = ? Finding the percentage of diverse numbers worksheet. e.g. 23% of 89 = ? Finding the percentage of some numbers with round figures worksheet. Learn subtraction of large numbers in a circle drill puzzle worksheet. Subtraction problems table drill puzzle worksheet. Subtract large numbers up to hundred thousands worksheet e.g. 230,897 - 4557 = ? Subtract numbers up to millions place worksheet for 6th graders. Interpreting data represented in tabular form worksheet. Solve the problems that follow. Table data interpretation worksheet, respond to emerging questions. Data on tables worksheet on activities carried out by students on a farm. Tabular data worksheet for students to learn to obtain information and represent synthetically. Table of summarized data worksheet for 6th graders to learn data interpretation. More on tables and statistics for 6th graders with this worksheet. Review skills in 6th grade on representing data in a table worksheet. Review skills on statistics and data in 6th grade with this math worksheet. How to understand data represented on a table worksheet. Tables and information about activities for kids to interpret - math worksheet. Table containing data in rows and columns for kids to interpret - math worksheet for 6th graders. Telling time in a.m. & p.m. Telling time while reading clocks but also noting if it is a.m. or p.m. worksheet for extra practice. 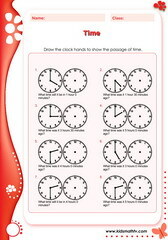 Telling time worksheet featuring a clock face with roman numerals worksheet. Reading time past after some hours or minutes on analogue clocks worksheet. 6th grade math worksheets in pdf printable format. Each worksheet contains a series of sixth grade math problems and to make it easy each worksheet has an answer key attached to the second page. Identify and print out a worksheet on any topic of interest. Get kids to solve problems on them as tests or as extra homework material to supplement their course. 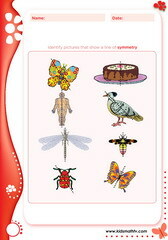 You can also make a collection into an ebook of all worksheets of interest. The following math topics in line with common core state standards are covered: data and graphs, polygons and segments, pythagorean theorem, area of figures, scientific notation, ratios, decimals, percentages, algebra I and pre - algebra, division, multiplication and more.